Jerry Prochnow, President of Kickapoo Creek Nursery, started his first job in high school at Custer Brothers Nursery located previously in Normal, Il. This is where he found exactly what his passion was and discovered what it would grow into. Helping customers and working on his expertise of planting and growing material would create a path for what it is today. After years of experience, Jerry decided to take his work and build something he had dreamed of for years. 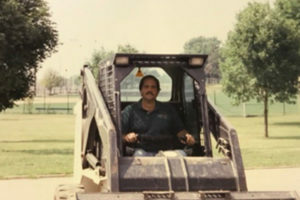 In 1983, he created Prochnow Landscaping, Inc. A business that has worked with many companies and universities including State Farm, Illinois State University, Illinois Wesleyan University, Mitsubishi Motors, and Illinois Farm Bureau. All important pieces of the community we call home. With the landscaping business using a high volume of plant material, the Prochnow family had decided to find a solution. In 1987, Jerry purchased a 160-acre site allowing plenty of space for a growing plants and trees, as well as a place they could call home located outside of Bloomington, Illinois. 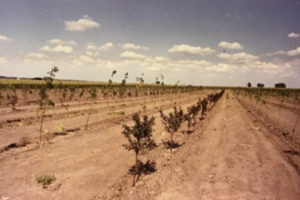 Kickapoo Creek Nursery’s first season was in 1988, taking place during the 100 year drought. With a rough first season, the Prochnow family learned how to maintain and ensure quality even through harsh conditions. In addition to the vast amount of trees, the Prochnow’s added their first greenhouse in 1989 full of perennials, shrubs and groundcover. Kickapoo Creek Nursery is full of plants ranging in size and color, ready to be planted at your home! We are happy to maintain and operate Kickapoo Creek Nursery to this day with the same family focus and to create a quality space of color with the efficiency of easy installation from our home to yours. Eric Prochnow, son of Jerry Prochnow, has been a part of the business his whole life learning with a hands-on approach. Working with his father from a young age he was fascinated with the process of growing plants and helping prepare for each season. Eric, along with his team is here to help provide designand create the ideal landscape for consumers using a wholesale market approach. Come join us this season and create that unique space at the price you want to pay!